If you’ve seen the movie Grease or the classic Rebel Without A Cause, you’ll recognize this one instantly. 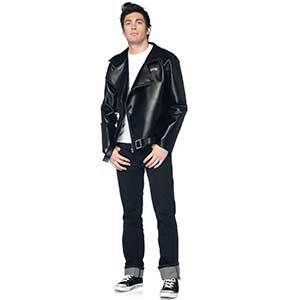 The Greaser is a solid, yet simple costume that works for all shapes and sizes. All you need is a faux (or real) leather jacket, blue jeans, a white t-shirt, and a pair of black chucks. Compliment that with a pompadour hair cut, which is probaly going to be a wig seeing as that hairstyle’s a little out of date, and you’re golden. 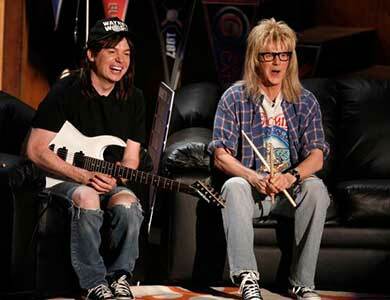 Love the adventures of Wayne Campbell and Garth Algar? Rejoice because you can look just like them for halloween. Starting with a pair of black chucks, go out and find a pair of cut up blue jeans. From there, you can easily be Wayne or Garth. For Wayne, a black t-shirt, brown long haired wig and Wayne’s World hat will do. For Garth, grab a pair of thick black glasses frames, long blonde wig, flannel and rock band t-shirt. 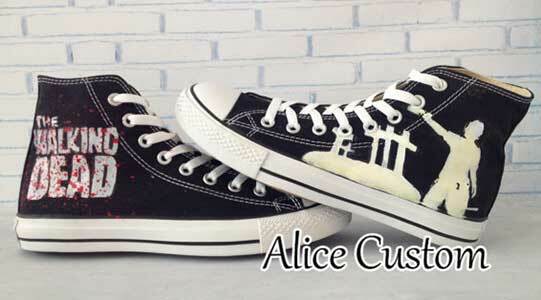 For the less creative individual, you can basically pair chucks with any kind of costume. Want to be an apple? Grab an apple suit and a pair of red chucks. Love Flo from those Progressive commercials? If you’ve got a pair of navy blue chucks, the other ingredients aren’t hard to find. I’m not joking about that last one, there’s an entire page on Progressive’s website dedicated to how to dress like Flo. Zombies wear chucks, so can ghosts. Chucks are some of the most versatile shoes out there, so don’t fret if you can’t find a costume right away. 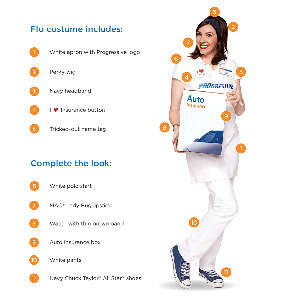 The Flo costume (click to see full size picture), Mike Myers Halloween high tops, space costume worn with chucks. If you thought these chucks were going to be orange and black things again. 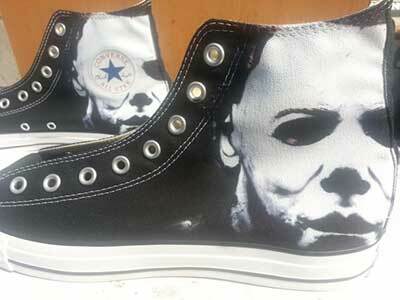 These chucks are THAT Halloween edition. Featuring the bone-chilling mug of famed silver screen serial killer Mike Meyers, these chucks are sure to freak more than a few people out. Another custom pair, but definitely one that needs to be mass produced, these Walking Dead chucks are a must for any favorite of the show. Featuring the blood soaked show logo on one shoe and an outline of zombie slayer and badass Rick Grimes on the other, these chucks make great shoes for Sundays in front of the TV.